Book a room to access exclusive Buffet Pass offer, only MOP688, 4 buffet accesses, 6 buffet choices! 888 Buffet offers a large selection of international cuisines ranging from local Macanese, Portuguese, continental Europe, Chinese, Japanese and Thai cuisines; as well as fresh seafood selection that include oysters, crab, sushi and sashimi; allowing our guests to enjoy the freshness and abundance of delicacies from around the world. Starting your day with a good breakfast is one of the best health decisions you can make. Come Sands 888 Buffet to enjoy your Breakfast Buffet with over 100 Choice! Looking for an excellent lunch? You've come to the right place! 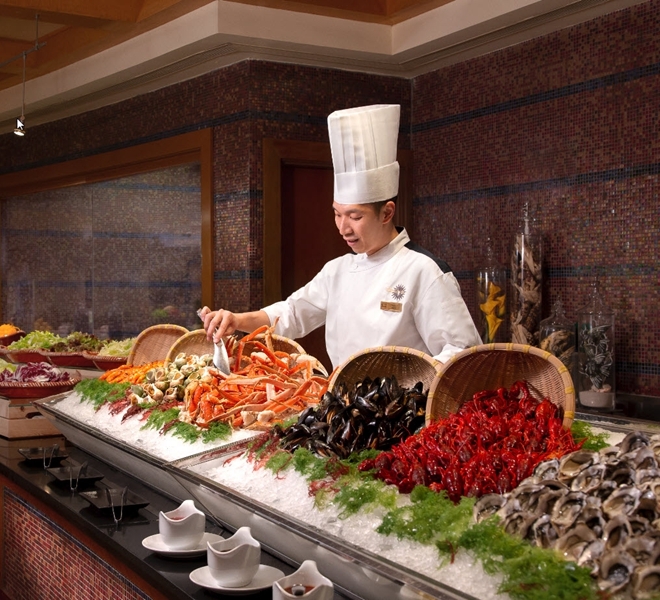 Enjoy an incredible lunch buffet with promotion price for just MOP208+ at 888 Buffet. There’s always something delicious waiting for you at 888 buffet and just help yourself to a wide variety of choices for the great dinner. Price: MOP688+ for adults, MOP344+ for child.